William Quincy Belle: Turducken: tur-what-in (the heck)? I think the first time I heard this word was about 7 or 8 years ago when an American woman visiting the family brought one for an outdoor patio meal. I smile at how the Americans love to mangle the English language in search for new words, new formations, and new abbreviations, whatever. I rolled my eyes at the word and said to myself, "Now what?" I listened to the description of how a chicken is stuffed inside a duck which is then stuffed inside a turkey: tur(key) - duck - (chick)en. WTH? What the heck? I'm sorry; this just sounded a tad bizarre. However being a brave man I stepped right up to the table with my plate and served myself up a helping. My impression? I don't think my palette could quite figure out just what it was tasting. There seemed to be such a mishmash of flavours. Was I eating chicken? Was I eating duck? My brain had an expectation of something but what the taste buds were reporting back to it didn't match the brain's memories of that flavour. In the end, I can't say I was partial to the dish. I love chicken; I love duck; I love turkey but all mixed together? I didn't know what to taste. Now granted, that was just one recipe. Are there others? The Internet seems to have scads of them so maybe one of these other recipes may make a believer out of me but at the moment, I am remaining sceptical. Oh and I'm not dismissing this because of just one go with the triple bird. I had another occasion to taste this woman's culinary artistry regarding this dish and the second time didn't leave me panting for more. I'm not sure if my reaction is strange as it seems there are people who swear by this dish. Beats me why. Nevertheless, my research into this dish leads me to rethink this as something more popular or mainstream then I initially thought. After all, Paul Prudhomme, the American celebrity chef has a recipe for this which would give the dish an air of legitimacy. This isn't just some screwball I-got-drunk-one-night-and-thought-three-birds-would-be-funny meal. In fact, it seems that the whole idea of cooking more than one bird or more than one animal together has been around for a long, long time; centuries if not millenniums back to the Romans. Wikipedia's article on turducken talks of a company called Hebert's Specialty Meats in Maurice, Louisiana where supposed this dish started in America. According to a story, a local farmer brought in his birds and asked the company to prepare them a certain way and the company has continued since 1985 to make the dish. Their web site says they sell about 3,300 turduckens per year. I see that there are variations on this dish. 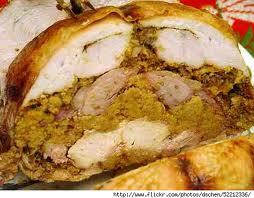 A "gooducken" is a chicken stuffed in a duck which is stuffed in a goose. In England, there are various multi-bird roasts including a five-bird roast: a goose, a turkey, a chicken, a pheasant, and a pigeon, stuffed with sausage. Some newspapers have run stories about how people, in search of something new for the holiday season have decided to replace the traditional turkey with a turducken. Really? Is this thing catching on? Other than the American woman, I've never been anywhere else when somebody has offered me that dish. For me, it seems like a rarity. Turducken stories are out of date. This year's hot trend is turducklambhamcowen.